These types of bearings are self-aligning and feature a large load rating capacity. Therefore, spherical roller bearings are suitable for low/medium speed applications which involve heavy or impact loading. They come with cylindrical or tapered bores and can be supplied with adapter assemblies as well as withdrawal sleeves. Bearings with a tapered bore can be fit and removed easily using an adapter assembly or withdrawal sleeve. Spherical roller bearings are available as double-row, combination radial and thrust bearings. They use a spherical or crowned roller as the rolling element. The race in the outer ring is spherical in shape, which allows for some misalignment of the shaft and the housing. The self-alignment feature accommodates up to 2 degrees of misalignment. Spherical roller bearings are unequalled in their capacity for high loads and their tolerance to shock loads, but have limited speed capabilities. They perform consistently, even under extreme conditions, such as application-specific stress and marginal lubrication. A machined bronze retainer is available which is ideal for higher speed operation and ensures better performance under marginal lubrication conditions. 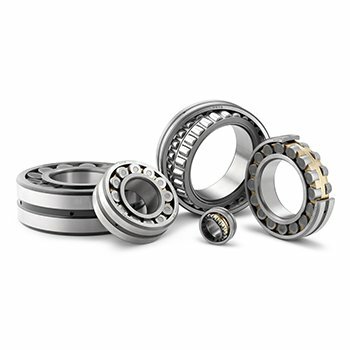 These bearings are divided into R, RH(R) and RHA types, which differ in internal structure. Asymmetrical roller design, which reduces sliding friction and has less tendency for roller skew while operating (R & RR types); this type uses two sets of convex asymmetrical rollers separated by a central inner ring rib. Symmetrical roller design (RH & RHR types) with two rows of longer symmetrical rollers, pressed steel cage, and a center guide ring instead of a rib. R and RH Type Spherical Roller Bearings are also available with lubrication holes and grooves, which optimizes lubricant capability.